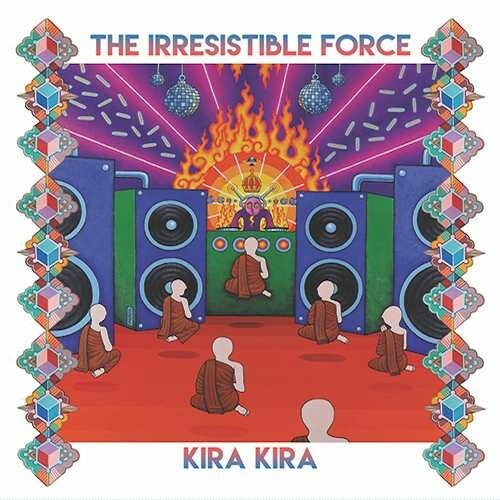 The Irresistible Force returns with ‘Kira Kira’, his first original album in nearly ten years. The album dips and dives through lush ambient soundscapes, combining Mixmaster Morris’ signature use of crate digging, live instrumentation, and swirling electronics. ‘Kira Kira’ expands on The Irresistible Force sound, exploring the depths of ambient and chillout music. The music draws you through a maze of japanese influences, dub basslines (courtesy of the legendary Jah Wobble), balearic textures, and the jazz tinged sound of Nik Turner’s (Hawkwind) saxophone. The bulk of the album was created in Youth’s Space Mountain Studios in the suitably epic, yet idyllic, mountains of southern Spain. Acting as production supervisor, Youth brings his own unique feel to the album, adding warbling arpeggios and a modern aesthetic to the classic sound of The Irresistible Force. Released on Youth’s Liquid Sound Design label, ‘Kira Kira’ is a hypnotic and exhilirating return to form for The Irresistible Force.